The Porter Cable PC60TCTAG 4-1/2 Inch Cut-Off Tool and Angle Grinder Kit comes equipped to tackle just about any grinding or metal cutting project you can throw at it. 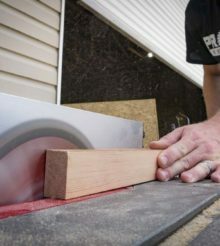 Given that two different blade guards are included, one that is optimized for grinding and the other one for cutting, you can be sure that not only can you complete the task at hand but also do it safely. Just to sweeten the deal and get you started on your projects, they threw in 5 general purpose grinding wheels and 5 cut off wheels in the box! With 6 amps of power, a compact size, and a rock bottom price, we are pretty sure that this angle grinder combo pack is a winner. Porter Cable ships this tool kit in a retail-ready cardboard box with everything individually packaged and wrapped inside. Inside the box was the PC60TCTAG 4-1/2″ Cut-Off Tool and Angle Grinder that includes an assortment of grinding and cutoff wheels, removable side handle, grinding guard, metal cutting guard, a spanner wrench and, last but not least, the instruction manual. Since this grinder comes with some extra parts and tools, we were a little bummed that it did not include even a simple tool bag or something for a more permanent storage solution. The motor frame and main body are made of black or gray ABS plastic and the front gear housing is made of cast aluminum which should go a long ways towards increasing durability and tool longevity. The screw-in handle is also made of black ABS plastic and is textured for good grip and slightly oversized to make it easy to hold onto even with gloves on. We liked that there were three different points in the gear housing where you can install the handle for better grip and control. In the front and back of the body there are air vents to keep the 6.0 amp motor running cool. On the left side is a sliding thumb switch that activates the grinder. By pressing the switch forward, it can be slid to a point where it will lock, keeping the grinder in the On position without having to hold the switch in. This can be particularly advantageous when you need to use the tool for extended amounts. Changing cutting/grinding wheels is a cinch, simply press the red button on top of the gear housing to make the spindle lock and then use the included spanner wrench to loosen the nut. One thing that we really liked about this grinder is that the blade guards can be swapped or adjusted by loosening a lever where the guard attaches to the grinder and then locking it back in place – all without any extra tools. The power cable has a heavy rubber strain relief where it enters the body and the cord is about 6 feet long. To test Porter Cable’s PC60TCTAG 4-1/2 Inch Cut-Off Tool and Angle Grinder Kit, one of the very first things we used it for was to sharpen some lawnmower blades. Using one of the included grinding wheels for metal, we proceeded to sharpen the blades, being careful to maintain the original cutting angle on the edge of the steel. While doing our grinding work, the Porter Cable demonstrated plenty of power by not bogging down at all, even when we leaned into it. Needless to say, it made very fast work of getting the blades sharpened thanks to an 11,000 RPM spindle speed. The angle grinder also worked great for smoothing welding beads because, with the handle mounted on the left side, we were able to control the grinder so we could make smooth strokes and have plenty of control. Just to test how fast it could cut through steel, we took a piece of 1/8′ x 2″ cold steel and sliced off a couple pieces. To do this, we first took the metal grinding wheel off, then we removed the grinding guard and installed the cut-off guard. With a fresh cut-off wheel loaded in, we locked it down with the spindle nut. It is worth pointing out that there are two sides to the lock nut, one side has a small rim around it and the other side is flat. When using it for a metal cutting wheel the rim must face out or the wheel will not tighten properly. For standard grinding wheels, the rim on the nut needs to be facing in towards the wheel. When we were finally ready to start cutting the steel, we first clamped it down and then went to town. The angle grinder cut very well for its small size as it sliced through the steel with ease. Just like the mower blades, it never slowed down and had more than enough power to do what we asked of it. Just like using most angle grinders on the market, this one is pretty loud, so we definitely recommend that you use hearing protection and throw on some safety glasses while you are at it! All in all, when holding the grinder in my hand. I found that it fit very well. The body is fairly small and we also appreciated that it felt rugged enough to handle lots of use. The Porter Cable PC60TCTAG 4-1/2 Inch Cut-Off Tool and Angle Grinder Kit proved to be a very handy tool to have around the shop. We really liked the power that this relatively small tool demonstrated and the interchangeable wheel guards. The fact that grinding and cut-off wheels were included in the kit is great because it’s what makes this kit ready to work right out of the box. For our Performance rating, we gave this grinder an 7/10 score since it came with two blade guards, a stack of cut-off wheels and grinding disks. We do wish that it had some rubber overmold on the grip points and a little better solution for storing all the parts and pieces. For a Value rating, we gave this grinder kit an 8/10 because for its power, its features, and a price that makes it a pretty good deal. Matthias Gaige is a contributing writer for Pro Tool Reviews. Bosch X-Lock Grinder and Wheels – No More Spanner Wrenches!